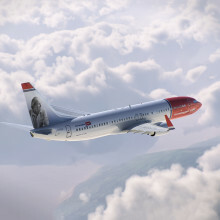 ​Norwegian today unveiled plans for world-famous author Roald Dahl to become its first ever British ‘tail fin hero’, with the author’s portrait set to appear on a Norwegian aircraft. Dahl was also a U.S. citizen. The announcement comes on ‘Roald Dahl Day’ as part of celebrations to mark Roald Dahl 100.